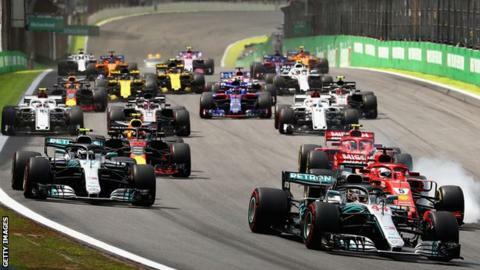 Formula 1 is being reinvented - some might say revolutionised - and if it's a success, it will be closer, more competitive and more exciting. Everyone involved in the sport has known for years that one of its biggest problems is that the cars cannot easily race closely together. Now, F1's bosses have set themselves the task of addressing this in time for a major reset of the many aspects of the sport in 2021, and they believe they are getting somewhere. "I'm confident we are going to make a big step forward," says Pat Symonds, Formula 1's technical director and the man leading research into the new-look F1. "I think we'll have a much more race-able car. I think we'll have a better-looking car." Revealing exclusive details about the cars that will race in 2021, this is how they are planning to do it. Symonds and his small team of former F1 engineers at the central London headquarters of the sport's owners Liberty Media have been looking at ways of solving a problem that has haunted the sport for decades. The current cars have awesome performance, with braking forces as much as six times the force of gravity and cornering forces that can top 5G. But the way they generate that performance is exactly why drivers find it so difficult to race. The performance comes from huge amounts of aerodynamic downforce. But the cars can only generate that load if they are driving on their own. Put another car in front of them, and the airflow to the car behind is badly disrupted - and that has a huge effect on how much downforce it can create. A 2018 F1 car following another car within 10 metres would lose as much as half of its total downforce. So it is literally physically impossible for that car to keep up. They only way a car behind could follow at the same speed as one in front was if it fell back to about two seconds adrift, out of this 'dirty air'. Which by definition makes it impossible to overtake it. To look at it from a performance perspective, on the vast majority of F1 circuits in 2018, a car following behind needed to have a lap-time advantage of nearly two seconds to overtake the one in front. In other words, two closely matched cars competing for the lead cannot reasonably be expected to overtake each other. In many ways, it's a miracle there is any overtaking. What is F1 doing about it? Symonds - who works under F1 sporting boss Ross Brawn - set his team the task of studying what aerodynamic phenomena led to cars performing in this way, and what could be done about it. Their starting point was to ask an industrial designer to come up with a series of concepts for what a 2021 car could look like, based on a brief that it had to be open-wheel and open-cockpit, but to improve the aesthetic appeal. Symonds discussed the results with F1 chief executive Chase Carey, Brawn and marketing boss Sean Bratches and they agreed on one of the five concepts. The task for Symonds and his team was then to come up with a way to make it produce downforce levels that would give it F1-style performance, but with much reduced negative effects. Symonds says: "The whole research is about the effect on the car that's following. And our aim right through the project is to try to present air to the following car that allows it to produce a level of downforce that's close to it being in free air. "It's never going to be the same as it is in free air, but we're just trying to get as close as we can to that." The initial task was to study the wake - the airflow behind the car - and see if it could be made more benign to a car behind. They used computational fluid dynamics, a way of simulating airflow over and behind a surface using software, and mixed different methods beyond the standard approach used by F1 teams to drill down into the detail of the airflow. And they asked the teams to be involved, by giving each one specific areas to focus on, and pooling the results on a confidential basis - so no single team would know which team had done which work. The current problem is that the wake is low down, and creates a low-pressure area directly behind a car. And the car behind needs high-pressure air to generate its downforce. The F1 group needed to find a way to make the wake sit higher. Symonds says they have found "a remarkable improvement". "When conditions are good, if we can ensure they are not broken down, then we've made a difference of many tens of per cent of performance of the following car," he says. There are caveats. Symonds won't quote numbers, he says, because "we're not yet sure whether we can maintain that improvement under all conditions, and therefore it is not particularly valid to quote numbers". But given that current cars are losing half their downforce, and there are only five lots of 10% between 50 and 100%, one can assume that Symonds and his team must be somewhere in the region of 90% or so of retained downforce for the car behind. If so, it would be a remarkable achievement. What's wrong with the current car design? What this means is that in 2021 F1 cars will be generating their downforce in a completely different way to now. Currently, this is done through controlling vortices of air that spin off certain parts of the car, manipulating and accelerating them through particular areas of the upper bodywork, until they flow to the back of the car, where some of the air flows between the rear wheels above the floor, but much of it goes under the sides of the floor in front of the rear wheels and through what is known as the diffuser at the rear of the car - the central floor between the wheels. Perhaps the key vortex is what is known as the Y250 vortex. This flows in two streams off each side of the front wing, where a mandated neutral section - the flat bit in the middle - connects with the areas outside it that teams are allowed to manipulate. This vortex then flows, on each side of the car, inside the front wheels, around the outside of the bodywork either side of the driver, and towards the rear. This vortex is extremely powerful - but it is also extremely sensitive to the airflow to the front wing being disrupted. Reduce the airflow to the front wing, and the vortices lose power - and, hey presto, the car's downforce is dramatically cut. How are they fixing it? The task was to eliminate these vortices and create the downforce in another way that had two differences - it was less sensitive to a car in front, and it sends the airflow behind the car higher into the air. Symonds calls this higher wake - created by what is called an "up-wash" effect - a "mushroom" because of the shape it forms in CFD pictures. "What we want to do is have more robust flow structures," Symonds says. "We don't want to have to rely on some of these vortical structures which work fine when a car is in good condition but don't work fine when it is in the wake of another car. "That's led us to a number of things. It's led us to be producing more of the downforce from the underbody of the car, but at the same time we need to rely on producing a lot of the downforce from the combination of a diffuser and rear wing system because we need to up-wash the wake, the wake being very dirty, low-energy air. We want to up-wash it over the top of the following car." The idea that the solution to the overtaking problems experienced by current cars was to produce a greater proportion of the car's total downforce from the underbody has been touted as a panacea in some quarters for some years now. It harks back to the late 1970s and early 1980s, the days of so-called 'ground effect', when the harnessing of underbody airflow using a floor shape known as a venturi led to prodigious improvements in performance - so much so, that it was eventually banned. But since F1 has moved towards what might be called vortex-based aerodynamics, other areas of the sport have retained underfloor aerodynamics to a greater or lesser extent - primarily IndyCars and endurance prototype racing (Le Mans, to the layman). And the drivers of these cars have been saying for a while that F1 should head in that direction, too, because it is much easier to race closely in those cars than in F1 cars. A key proponent of this view has been Alexander Wurz, the former F1 driver and two-time Le Mans winner, who is also the chairman of the Grand Prix Drivers' Association. Symonds again won't give numbers on how much downforce will be generated from the underbody as a proportion of the total, and compare it to now, but it's clear from reading between the lines of what he does say that the shift is substantial. F1's interrogation of aerodynamics does not stop there. A lot of effort has also gone into understanding the effect of tyres on airflow. This is quite large on current cars, because the tyres have such tall sidewalls, a function of the 13-inch wheels used in F1. These are now totally out of step with road-car wheels, where even mundane family hatchbacks now typically have 18-inch rims. Engineers will argue that smaller wheels might not look as cool, but they are actually better for performance - not least because the wheels are lighter. But the 'spring effect' in the sidewalls also has a surprisingly large effect on aerodynamics, and this will be removed in 2021 by a switch to 18-inch wheels. "One of the things that is quite important is that there are areas of aerodynamics that are actually very difficult to understand," Symonds says, "and they are rewarded by having enormous aerodynamic teams working on them. A lot of that has to do with the flow around the wheels and tyres, because the tyres move so much. "So one of the things we've done is go to 18-inch wheels and lower profile tyres. Because those tyres will move around less, so it is an easier problem to solve. And we hope then all the teams will have a slightly more equal chance with the big teams." The work on aerodynamics is not complete. Symonds says that while they have made the rear of the car "robust", the same is not true yet of the front. "We need to continue work on that," he says. "Because if you do break down the flow structures we've got, the performance just disappears. For example, we have done some changes on the front-wing design which has shown it is quite sensitive and we can lose probably a quarter of what we've gained just by a small change. So we've got to eliminate that sensitivity in those areas." Meanwhile, the new aerodynamic rules are just one part of a wholesale restructure of F1, with changes planned - but not yet agreed - to the revenue split and a cost cap for key parts, with a final aim to bring the grid closer together. "We have around a 3% performance difference between the front and back of the grid," Symonds says. "If we could get that to 1.5%, on top of cars being able to follow a bit closer, and on top of cars that are not quite so expensive to make, then we really will have changed something."